I am hampered in my work by a thousand interruptions. Nearly every hour comes a letter from some scholar, and if I undertook to reply to them all, I should be obliged to devote day and night to scribbling. Then, through the day come calls from all kinds of visitors. Some desire merely to give a word of greeting, others want to know what there is new, while the greater number come to my office because they happen to have nothing else to do. "Let us look in upon Aldus," they say to each other. Then they loaf in and sit and chatter to no purpose. 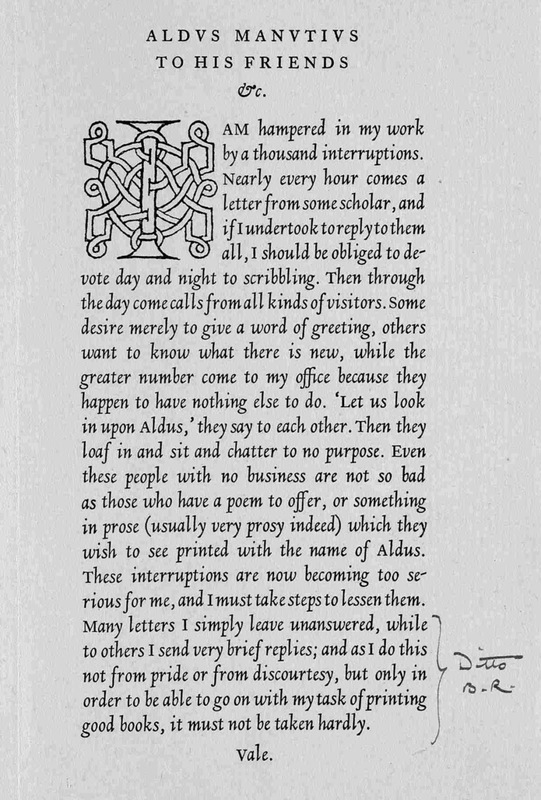 Even these people with no business are not so bad as those who have a poem to offer or something in prose (usually very prosy indeed) which they wish to see printed with the name of Aldus. These interruptions are now becoming too serious for me, and I must take steps to lessen them. 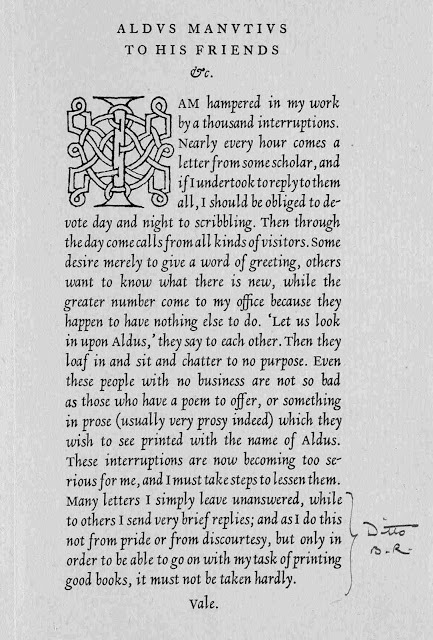 Many letters I simply leave unanswered, while to others I send very brief replies; and as I do this not from pride or from discourtesy, but simply in order to be able to go on with my task of printing good books, it must not be taken hardly.